Determination of moisture content in food, chemical and pharmaceutical products is often a key parameter in quality and process-control. Loss on drying (LOD) methods are typically used to determine moisture content, with established reference methods often based on drying ovens. Halogen moisture analyzers (HMA) are a fast alternative method for LOD. This White Paper explains the key decision criteria surrounding the choice of method and provides practical guidance on how to demonstrate that the two different methods (drying oven vs HMA) deliver comparable results. 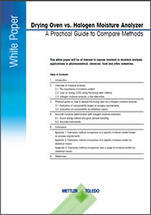 Request your free White Paper to enable validation of your method, assuring accurate moisture measurement.